Last weekend’s Der Klassiker was billed as a battle between an emerging force and an aging power, with Lucien Favre’s youthful BVB taking on Niko Kovač’s rejuvenated Bayern in a top-of-the-table clash that had serious ramifications for the Bundesliga championship. Coming into the match, the Black-and-Yellows held a two-point lead over the reigning champions, and were boosted by the return of captain and attacking lynchpin Marco Reus to the matchday squad. Three consecutive victories over Stuttgart, Hertha Berlin and Wolfsburg meant that BVB headed into the Klassiker in a positive frame of mind, especially when compared to Bayern, who had seen a six-match win streak ended in a 1-1 away draw with Freiburg. After a back-and-forth nail-biter in November which saw Dortmund take all 3 points, Bayern routed Dortmund 6-0, establishing supremacy at the top of the table. Going by Uli Hoeneß’ pre-game comments, it was clear that Niko Kovač’s future would depend on the outcome of this match, and it is fair to say that the Croatian exceeded expectations with his selections and tactical approach. Jérôme Boateng and Leon Goretzka made way for Niklas Süle and the evergreen Javi Martínez, and the muscle brought in by these two proved crucial as Bayern dominated the midfield battle against an ineffective BVB. During the build-up phase, Bayern’s centre backs split, with the full-backs pushing up and the midfield pivot of Martínez and Thiago taking control of the ball. But for much of the match Bayern were in a position to relentlessly attack Favre’s backtracking side, with the home side maintaining a 3-3-1-3 formation during this phase. Right back Joshua Kimmich didn’t venture forward as much as usual and stuck to his centre-backs, with David Alaba pushing up to join Thiago and Martínez as part of the midfield line. Up front, it was Robert Lewandowski as the spearhead of attack, with wingers Kingsley Coman and Serge Gnabry staying wide, and Thomas Müller was given free license to roam between the midfield lines. In defense, Bayern would often flatten into a 4-4-2 shape, with Müller joining Lewandowski up top, as the wingers would drop to form a four-man midfield geared at cutting out the supply line to BVB’s front three. The highlight reel of the match will show that Lewandowski and Hummels returned to haunt their former side, but the real story of the match was Thiago and Javi Martinez bossing the centre of the pitch. During Bayern’s attacking phase, Martínez stayed deep to break up any attacks, with Thiago monopolising the area around the centre circle. It was because of Thiago that Coman and Alaba got on the ball as frequently as they did, with Hummels, Süle and Martínez all relying on the No. 6 to get the ball up the pitch and out to the wings. 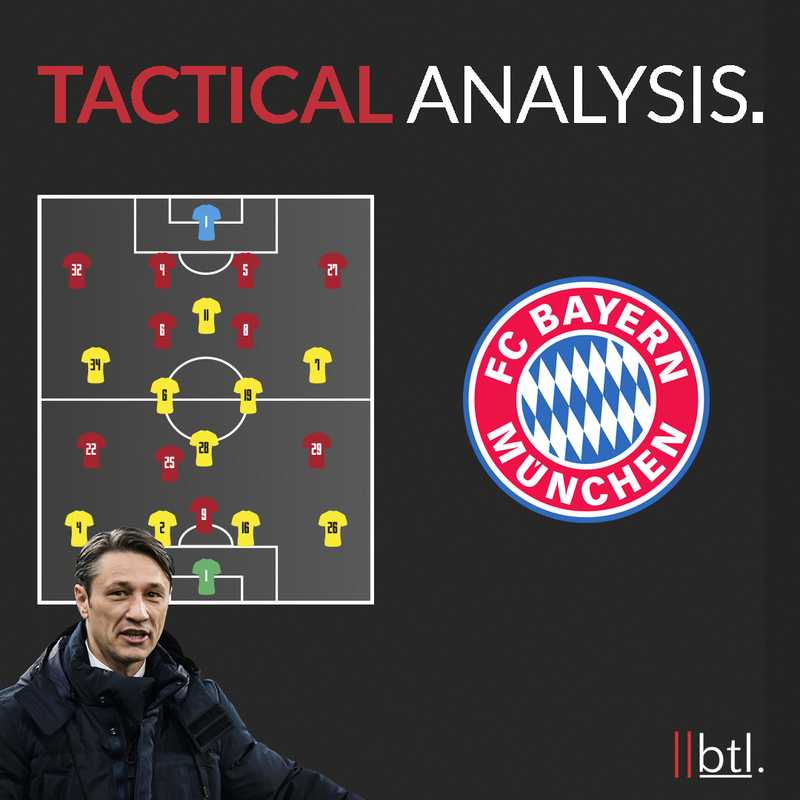 Der Klassiker saw a pronounced emphasis from Bayern on attacking BVB using the left wing, and this was a big reason for Alaba joining the midfield and Coman staying high and wide. But this approach would have been nearly as effective were it not for Thiago’s constant ball circulation, which kept things ticking for Bayern as they probed and prodded the BVB midfield. The Spaniard’s dead ball delivery was excellent as Hummels scored one and had a great chance to add a second, and Dortmund failing to close down Thiago with any degree of effectiveness was a big factor in the humbling defeat, a defeat which could decide the title race. The score-line might make it seem like Bayern had many excellent performers on the night, but the truth was that it was a standard Die Roten performance that received a major assist from a timid Dortmund midfield. Bayern’s first line of pressure came from Lewandowski and Müller, and they harried Dortmund’s centre-back pairing of Manuel Akanji and Dan-Axel Zagadou into making the kind of mistakes that from which Lewandowski scored his first goal of the night. Correspondingly, the full-backs were pressured by the wingers and Thiago was superb in dealing with Thomas Delaney and Mahmoud Dahoud, with Martínez staying back to shield the defence. Dortmund’s cautious and ineffective passing meant that they rarely ever threatened to score, save for an early first-half breakaway led by Jacob Bruun Larsen. Crowding the centre of the pitch with the help of Martínez, Thiago and Hummels meant that Dortmund was forced to play through the wings, but passes from the flanks were routinely cut out first by Martínez and later by his replacement Goretzka. BVB’s complete inability to deal with any form of aerial threat was fully exploited by Kovač’’s intense Bayern, as Dortmund’s extraordinarily youthful defence failed to deal with deliveries from Thiago, Kimmich, Coman and Gnabry. Dortmund set out a defensive formation, with Witsel, Delaney and Dahoud occupying the midfield spots. During the infrequent attacking phases, the Black-and-Yellows went with a 4-2-1-3 formation, with Dahoud playing as the attacking midfielder behind Reus, Bruun Larsen and Jadon Sancho. Witsel stayed behind to protect the defence with Delaney in a slightly advanced position, but on the whole the way they set up was irrelevant as all three proved completely ineffective. In defence, BVB moved to a 4-4-1-1 medium block, with wingers Bruun Larsen and Sancho dropping alongside Witsel and Delaney, and Dahoud took his place behind Reus with the two perennially prepared to initiate a quick counterattack. Apart from an outstanding Bruun Larsen breakaway early in the first half, Dortmund failed to muster anything of note over the course of 90 minutes, but the result may have been different had Dahoud managed to find the target. But he didn’t, and Dortmund continued to look short on confidence as their defence struggled to cope with Bayern’s relentless attack, with Hummels getting the better of Łukasz Piszczek far too easily for the first goal. This was compounded by Zagadou’s glaring error which allowed Lewandowski to get the ball with only goalkeeper Roman Burki to beat, and the Polish striker did brilliantly to find the back of the net for his 14th Klassiker goal. Both centre-backs were guilty of playing conservatively after that mistake with Zagadou in particular enduring a torrid 45, and it was no surprise to see him hauled off at the break for Julian Weigl. The full-backs Piszczek and Abdou Diallo were equally cautious and failed to provide any real width to Dortmund’s attack, leaving Sancho and Bruun Larsen with the job of finding creativity on the wings. Unsurprisingly the youngsters failed to come up with anything of note, as Reus was left isolated and unable to exert his usual influence for large parts of the game. The supply from midfield was also non-existent with Bayern’s press taking Delaney, Dahoud and later Gotze out of the game, which further compounded BVB’s problems. Goalkeeper Roman Bürki was the best player for Dortmund on the night and let in five goals despite making some good saves, and that really says it all as far as the away side’s performance is concerned. For a game that was billed as a season-defining clash the Klassiker was embarrassingly one-sided, as Bayern imposed their will on Favre’s side in a startling exhibition of strength and superiority. The result has Die Bayern top of the table with a one-point lead over BVB, and while there is still potential for late drama, few would bet against Bayern winning a 7th straight title. The challenge for Lucien Favre now is to ensure that no psychological scarring results from this beatdown, and BVB now need to win all their remaining games while hoping for a slip-up from the league leaders to secure a first title since 2012.